Game 1 Recap: Crunch Played Their Way and Dominated · Let's Go Amerks! The last 20 minutes of hockey on Friday night along with the post game comments felt like the middle of a losing streak in the middle of the season. That’s not the way the first game of the playoffs should end. One team in this series went to the Calder Cup finals last season and the other team lost more games than they won but still made it into the playoffs. The bright spot is that it’s only one game and this Amerks team has shown all season that they can respond and bounce back. The first period started out strong with Kevin Porter leading a two on one with Justin Bailey down the ice but Eddie Pasquale got a pad in the way preventing Bailey from lifting the puck. Everything from that point on was chasing what the Syracuse Crunch were doing. 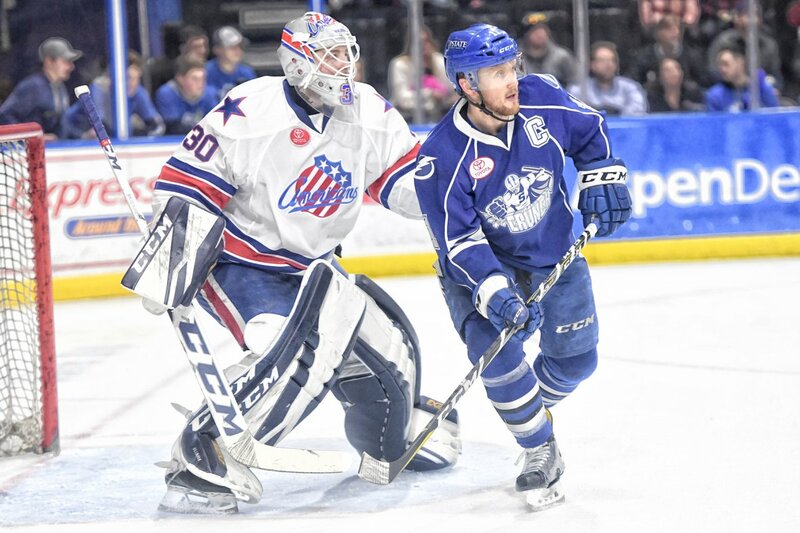 The Crunch were 11-1 on home ice last season in the playoffs and if the Amerks want to have a chance they only have one option for game two in Syracuse on Saturday night – win. Taylor Fedun took a stick to the face that sent him to the locker room to get stitched up in the first period. There wasn’t a call on the play and the Crunch scored. Less than a minute later Zach Redmond scored a power play goal from the point with his signature half slap shot, half wrist shot. Syracuse took the lead again after Rochester failed on at least three different chances to clear. Gabriel Dumont sent a pass to Jamie McBain and scored in the simplest way possible, throw it at the net with the goalie screened and see what happens. It went in the net. Kyle Criscuolo scored off a feed from CJ Smith with 51.9 seconds left in the first period to tie the game 2-2. That should have started a new hockey game. It didn’t. The Crunch took a 3-2 lead only 1:44 into the second period and that would have been all they needed to win. Dominik Masin was standing to the right of Ullmark and scored on a second chance rebound. Brendan Guhle wasn’t able to clear the puck, two players were in front of the net and Ullmark was left scrambling. Seth Griffith had a breakaway. It wasn’t going in. Ullmark has turned the puck over twice trying to play it. Dangerous. Malone, Fasching and Ross turning up the heat. A couple of attempts that shift. Linus can use some help this period. Anyone could have won the hockey game going into the third period but it was obvious which one was going to. Rochester continued chasing Syracuse around the ice. The Crunch scored three times, one was an empty net goal. Gabriel Dumont finished the game with 3G+1A. Benoit Groulx probably liked what he saw his team do in the third period and will be coaching them to repeat it on Saturday night. A team shouldn’t be talking about needing to shoot more pucks to the net in the playoffs. Chris Taylor said there will be changes in game two. He didn’t say what changes but there would be some. That could be line combinations or someone out of the lineup for someone else. We’ll find out when the team takes the ice for warm ups.